Coming to Christ, part 3, "God's Kingdom"
The things I want you to consider this evening must begin with a clear and certain understanding. You must understand several things about me. I love my country. One of the great gifts God gave me in life is the gift of being an American citizen. Because of situations I have experienced, I have an enormous appreciation for this nation. With my own eyes I have seen citizens in another country endure unjust, uncalled for abuse without recourse. Their own government had no regard for its citizens. I have talked with people face to face who literally cannot imagine our freedoms or our wealth. Around 1990 Joyce and I visited Poland to assist with some follow-up teaching in their "Lets' Start Talking" outreach. At that time Poland had reached independence for a few months. The major population area we were in was a very bleak place--no color, no advertising, very few things available--not even tooth brushes and toothpaste!. We returned to Poland about two years later for the same reason. The transformation was incredible! Color was everywhere! Advertisement was everywhere! New building activity was quite obvious! Most things available here were available there! While there the second time, we heard of a man who was visiting Poland from St. Petersburg, Russia. He said all of his life he dreamed of visiting America just to see the incredible things he heard about this country. As he returned to Russia, he said, "I no longer dream of going to America. I have been to Poland! It would be impossible for America to have as much as Poland has!" I love our freedoms, I love our prosperity, I love our opportunities, I love and enjoy our way of life. I lived for years in a place that had very few of the things we take for granted everyday of our lives. I so deeply appreciate living in this nation that on our first trip back to the USA in 1972, when I saw the huge American flag at customs, I cried. My most emotional experience in 1972 upon our return for a leave was going to a supermarket. I had not seen that much food or variety in almost two years! What I ask you to consider tonight has nothing to do with my not liking this nation. It has to do with understanding and loving God's kingdom. The Bible has a lot to say about God's rule. The New Testament often speaks of God's rule by speaking of the kingdom of God (Matthew often uses "the kingdom of heaven" because Israelites did not use the word "God" in order to protect against using God's holy name in vain). The kingdom of God was at the foundation of the preaching of John the Baptist. Matthew 3:1,2 Now in those days John the Baptist came, preaching in the wilderness of Judea, saying, "Repent, for the kingdom of heaven is at hand." The kingdom of God was at the foundation of Jesus' preaching. Matthew 4:17 From that time Jesus began to preach and say, "Repent, for the kingdom of heaven is at hand." May I call to your attention to something fascinating to me about John's and Jesus' emphasis on God's kingdom: both of them preached to people who thought they knew everything there was to know about God's rule, yet these people did not understand the rule of God. Paul divided the whole world into two realms: "the domain of darkness" (which is ruled by Satan) and "the kingdom of His beloved Son." Everyone was in the domain of darkness and needed deliverance. What everyone needed was to be moved from the domain of darkness and placed in the kingdom of Jesus where God rules. 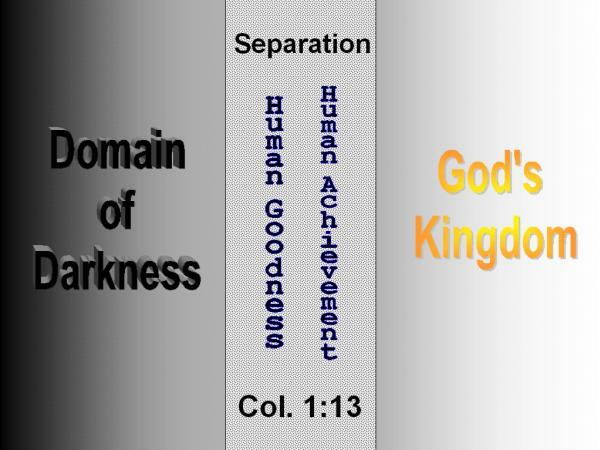 It is under God's rule through Jesus that we can have redemption (be freed from the control of the domain of darkness). It is under God's rule through Jesus that we can have the forgiveness of sins. The two cannot be separated. If we have one we have both. We cannot have redemption or the forgiveness of sins in the domain of darkness. However, we of ourselves could not change kingdoms. We could try to build a bridge across the separation of kingdoms through human goodness, but it could never bridge the gap. We could try to build a bridge across the separation of kingdoms through human achievement, but it could never bridge the gap. Thus then we of ourselves could produce no escape from the domain of darkness. If we were to escape from the domain of darkness and be placed in God's kingdom, Someone would have to build a bridge for us--we cannot and could not build it. I want you to notice on the chart that the further away from God we are, the greater the darkness increases. Those who have no influence of God in their lives are in the black area. The more influence God has in their lives, the more into the gray they move. Yet, if people go as close to God as they can get in the domain of darkness, they are still ruled by Satan and still in Satan's domain. Even if they want through their efforts to come closer to God, they of themselves cannot escape Satan's rule and enter God's rule. Why? We cannot produce our own redemption, our own forgiveness. Therefore Someone had to do something for us to benefit us that we could not do for ourselves. It was not and is not a matter of desire--while desire is important, that is not enough to produce a change of kingdoms and rules. It was not and is not a matter of preference--while preference is important, that is not enough to produce a change of kingdoms and rules. It was not and is not a matter of fearing the consequences--while fearing consequences is important, that is not enough to produce a change of kingdoms and rules. We of ourselves could not cause a change of kingdoms and rules--regardless of how we act or what we do. God through Jesus' death and resurrection did for us what we could not do for ourselves. God built the bridge that permitted us to escape the domain of darkness, to change kingdoms, and to change who rules us. God built the bridge with His grace, with His expression of love and kindness that no human deserves. 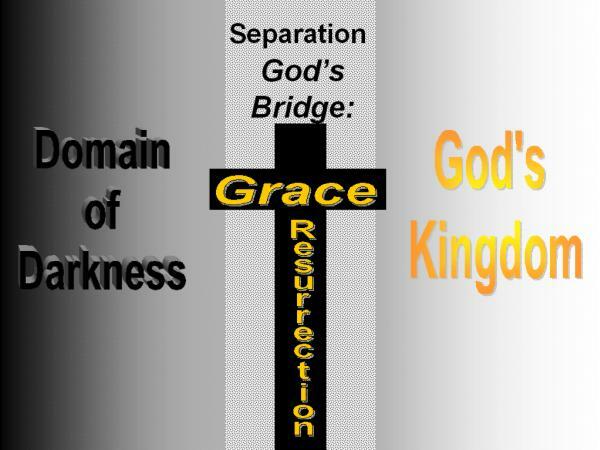 He built that bridge of grace with the blood of Jesus who died for our sins. That innocent blood provided us redemption, the forgiveness of sins. Then God raised Jesus from death to prove God could resurrect us from death--that God defeated our greatest enemy, the enemy of death. We are provided opportunity to change rulers, to change kingdoms because of what God did for us in Jesus' death and resurrection. Our objective is not to get across the bridge and sit down. The object is to cross the bridge and continue our journey toward God. We do not wish merely to be in God's kingdom, under God's control. Our entire lives we want to continue to move closer and closer to God. We change kingdoms because we want God to rule us--we will be ruled; we merely are choosing who our ruler will be. We do not change kingdoms to continue Satan's rule in our lives. The reason we enter God's kingdom is because we want God to rule us. God's kingdom exists to allow anyone who wants to be ruled by God to be in and a part of God's kingdom. That kingdom will ultimately experience a heavenly reality in which all who have been ruled by God on earth live in His presence after the judgment, and all who reject God's rule on earth are destroyed after the judgment. The purpose of God's kingdom is to rule those who choose God through Christ until they are permitted to exist in God's presence. We want and encourage people to leave the domain of darkness and enter the kingdom of God. We want and encourage people to have the kind of faith in Christ that results in God ruling their lives. We understand our journey in God's kingdom will reach its destination when we live in the presence of God. We will be faithful to God, submit willingly to His rule in our lives now, so we can live in His presence after the judgment. This is not the purpose of God's kingdom: to impose God's control and rule in the domain of darkness over people who have no faith in God, no faith in what God did for us in Jesus' blood and resurrection. The objective of God's kingdom never has been to control godless people through force; to make those in the domain of darkness surrender to a God they reject by giving Him some form of faithless obedience. We seek to call to God and influence for God through the examples of our lives as we surrender ourselves to God's rule. We do not seek to conquer the godless domain of darkness through law, but through faith in Jesus Christ and God. I am very afraid that we are concluding three things as Christians. I am afraid we are concluding that God's objectives are primarily accomplished through laws that favor Christianity instead of faith in God. I am afraid we are concluding that God' kingdom can exist only if laws that favor Christianity exist. I am afraid we redefine the objective of God's kingdom as controlling society instead of calling individuals to God's rule through faith in Jesus Christ. The more we accept any of those three things, the weaker Christians become spirituality. Let me use the social, moral problem of domestic violence as an example. Domestic violence is an enormous moral problem in our society, and it is growing rapidly. At this moment, 28% of everyone living in this society is a victim of domestic violence--that is more than one of every four people living in America! There are so many instances of domestic violence in this nation that on average an act of domestic violence occurs every 9 seconds. Domestic violence occurs in every economic level and in every social level in our society--in economically well to do families who live in $250,000 homes and in extremely poor families who own almost nothing. Children who grow up in homes witnessing domestic violence are 1000 times (that is correct!) more likely to be abused as adults. Women who flee domestic violence are 75% more likely to be murdered. Over 50% of the men who abuse their wives also abuse their children. Domestic violence is the leading cause of physical injury to women between the ages of 15 and 44 in this country. It is the # 1 cause of physical suffering for women--more women suffer injury through domestic violence than through car accidents, muggings, and rapes combined! 30% of all female murders are the result of a violent act of a husband or boyfriend--that has been at around 3,000 murders annually since 1990. To me the chilling realization is this: the greater majority of perpetrators of abuse were the victims of abuse as children! We have a huge moral problem in this society right now--what are we going to do to solve it? Someone says, "We simply must pass some laws that make this a crime." Do we have laws against murdering someone? Is not murder a crime? Do we have laws against beating and physically injuring an adult? Is such activity not a crime? Do we have laws against abusing children? Is not such abuse a crime? Have these laws solved these problems? The problem is not centered in a lack of laws--the problem is centered in ungodly, immoral behavior. So you ask me, "What are you saying, David? Can we not be concerned about laws, about the direction of society, about confronting evil in society?" Surely everyone of us can be! In our nation we have every right to express our concerns and views. I am saying two things: (1) the objective of God's rule is expressed through faith in Jesus Christ which changes us morally. The objective of God's rule is not controlling those who have no faith in God. (2) Passing laws will never be a substitute for godly living. Our basic concern is demonstrating God's rule to society through the way we live our lives. There are no short cuts to the influence of godly existence produced by letting God rule our lives. Let me give you something to consider. It is my understanding that the fastest growth ever experienced by the kingdom of God occurred in the first century. That occurred at a time when (1) Christianity was an illegal religion in a world of idolatry and (2) societies more brutal and immoral than most this society is today. The single greatest problem Christians have in influencing society today is found in the fact we do not let God rule our lives! Let people see the difference belonging to God makes in your life!